Bringing the first mass-produced v-8 Ford flathead into the 21st century with a near 300 mph Bonneville land speed record. The revolutionary DLI reversed port Vortech supercharged millennium engine began with a 1946 stock Ford block. DLI reversed the intake and exhaust ports and increased the displacement from 239 to 301 cubic inches. Other modifications include: Bruce Crower "inverse radius" roller cams, Moldex Billet crank, Ross domed forged aluminum pistons, Manley titanium valves, Accel digital fuel injection-computer controlled with MSD fuel injection, programmable and EFI coupled, Vortech crank driven T-trim blower with 16 pounds of boost, Tony Barron finned aluminum heads, duel Mallory super Magnetos with two spark plugs per cylinder. Ford’s fabulous flathead was declared dead 45 years ago, a victim of the overhead valve revolution. The declaration of its demise may have been premature. 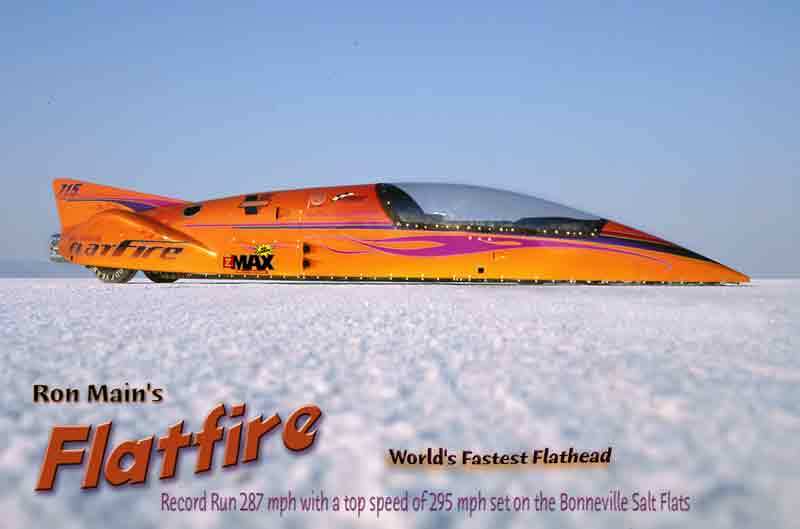 Flatfire’s first test runs at Bonneville this year with only 50% boost, the car easily reached speeds in excess of 240 mile per hour. The stearing is being adjusted for better handling for Flatfire’s land speed record attempt in 2000. 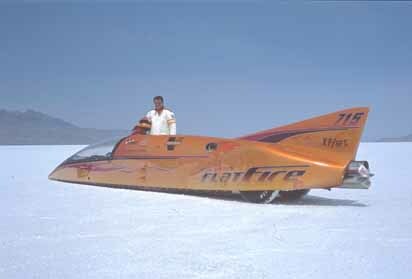 Flatfire and the [Vortech millennium Ford v-8 Ford flathead] engine has set as it goal a new land speed record of 300 mph at the Bonneville Salt Flats next year. The Ford Vortech powered car will be setting new land speed records in the year 2000. The dedication, talent and creativity of these uncommonly gifted people put together our latest effort to bring Ford's first Flathead V-8 into the Twenty-First Century with a Bonneville Land Speed Record Run for the new millennium.